Ads are sold based on the concept of blocks. 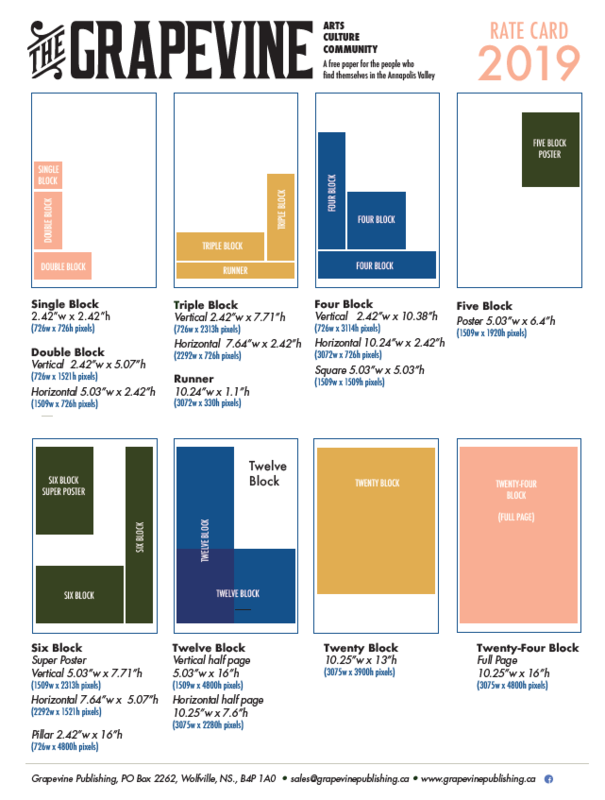 The dimensions of a single ad block are 2.42”w x 2.42”h. A single block costs $50 for B&W and $62 for color. Price per block drops with larger ads (multiple blocks) and for length of commitment. The Grapevine offers 30% discounts to nonprofits, charities, and art organizations wishing to place an event poster. 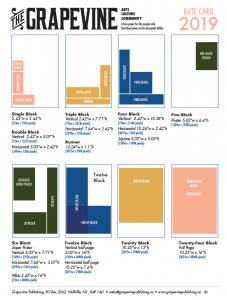 8.5×11 Posters (5 blocks) cost $76 for B&W and $92 for color. 11×17 Posters (6 blocks) cost $92 for B&W and $116 for color. Contact Emily Leeson, Director of Sales & Marketing at sales@grapevinepublishing.ca for more information.